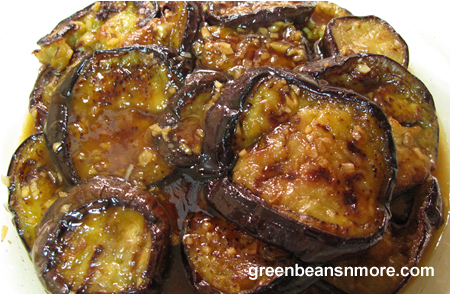 This tasty and easy to prepare eggplant dish would be a perfect addition to a Middle Eastern Meze. It comes from well know cook book author, Ghillie Basan, from her book Modern Moroccan. This is a recipe that is definitely best served the next day, room temperature. This appetizer dip was a nice change from the usual eggplant-tomato parings. Lay the eggplant slices out on paper towels, or cloth and sprinkle all cut surfaces generously with salt. Let the eggplants disgorge for about 15-20 minutes then wipe them dry with paper towels. Preheat a large, heavy skillet over medium-high heat. Brush both sides of the eggplant with olive oil and cook in the skillet, not overlapping the slices, until well browned on both sides. (You'll no doubt have to do this in batches.) Set the slices to a plate on the side. In a bowl combine the honey and lemon juice with about 2/3 cup of hot water. Stir to dissolve. Heat the skillet again, adding a bit more oil if none is left. Add the garlic and ginger, stirring for about 30 seconds, then add the cumin and harissa (or cayenne pepper) stirring another 30 seconds. Stir in the honey-lemon water and bring to a boil. Lay the eggplant pieces into the pan, overlapping if needed, and cook over medium heat for about 10 minutes, turning the pieces as necessary to ensure all are coated with the sauce. Cook until it reduces into a thick glaze and the eggplant pieces are completely soft. (add a bit more water if the sauce reduces before the eggplant is ready). Taste for seasoning, add salt if needed. Let cool, sprinkle with the chopped cilantro and serve at room temperature.